Halfshafts can be pressed onto new hubs although there will be a press charge. We cannot arrange for new halfshafts to be pushed onto old hubs for safety liability reasons. In addition, we would strongly advise against running an axle with both a new and an old halfshaft as the torque transfer is likely to cause the original halfshaft to fail. 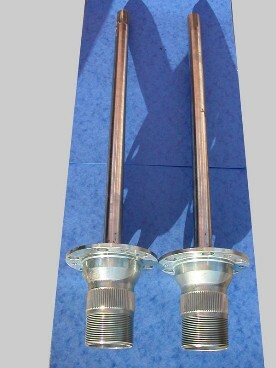 Halfshafts supplied are of high torque, racing quality. When ordering, please state which model you have as N, K ad T Type halfshafts are longer than the C/D/F/J/P and L Type lengths. Vintage MG Parts can supply both MMM or T Type halfshafts. Excluding postage which is mandatory for this item, £19.40 UK delivery per package up to 20 kg; cost for overseas dependant upon volumetric weight and destination. Please note that we can only combine postage for halfshafts with hubs and spinners and not with any other parts in our catalogue.